SNP arrays of primary RT samples and matched normal DNA. (A) Genome display of copy number changes. (B) Enlarged view of the SMARCB1 locus. 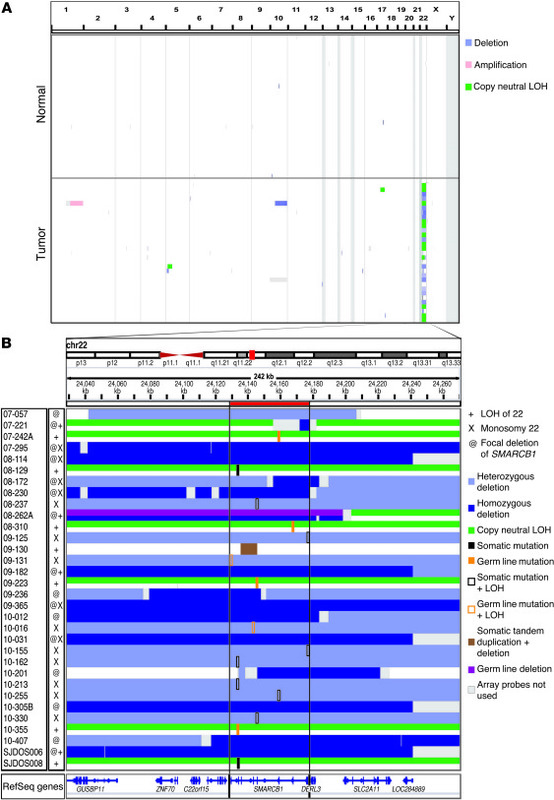 Mutations are overlaid on the SCNAs and loss-of-heterozygosity (LOH) tracks. Samples with focal deletions covering SMARCB1 are marked with “@.” Samples with monosomy 22 or loss of heterozygosity across 22 are marked with “x” or “+” next to the sample label. The red box represents the highlighted region of the chromosome, including the SMARCB1 locus shown below. Red triangles represent the centromeric regions of the chromosome. Chr, chromosome.